This is my most favorite Russian salad I’ve tried so far, that I make it more often than olivye or vinegret on most days. I believe that aside from the taste which is really good, this was the first Russian dish I ever tried in my life. It brings back memories of being warmly welcomed by my husband’ family the first time I met them. When I came to the US a few years ago, they held a small welcome party for me with lots of yummy foods and hours of fun and friendly conversations. I remembered trying out my sister-in-law’s crab and corn salad which I love. This is not her recipe, however. It’s my version based on online research then tweaking the recipes to suit my taste. 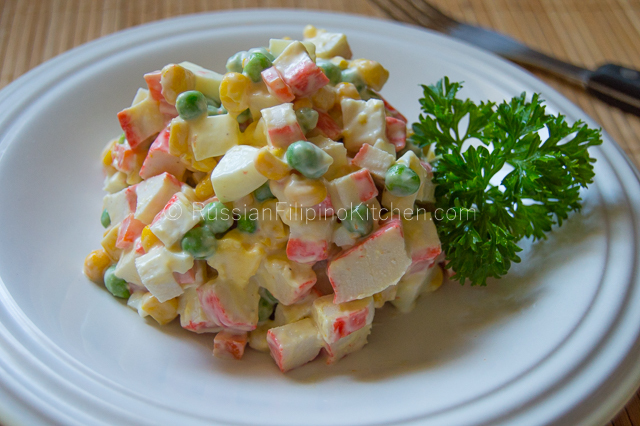 I will post some other time Alla’s recipe but for now enjoy making this easy peasy crab and corn salad with a simple mayo dressing. 1. In a medium sauce pan or cooking pan, place eggs and carrots together and add water just enough to cover. Bring to a boil and simmer over low medium for 15 minutes until carrots are soft enough to pierce. Note: I did this method many times and it works for me. Saves me the time, effort, dishes to wash afterwards, and of course the gas in cooking. However, you can use separate pots for boiling the egg and carrots, if you prefer. 2. While the eggs and carrots are getting cooked, drain can of corn and place corn kernels on a strainer over a bowl to further strain excess liquid. Set aside until ready to use. 3. Chop or dice crab meat into small cubes. 4. As soon as eggs and carrots are cooked, remove from heat, place in a colander, and rinse in cold water until cool enough to touch. Peel eggs and carrots. 5. Dice eggs into small pieces. 6. Dice carrots into small pieces as well. 7. 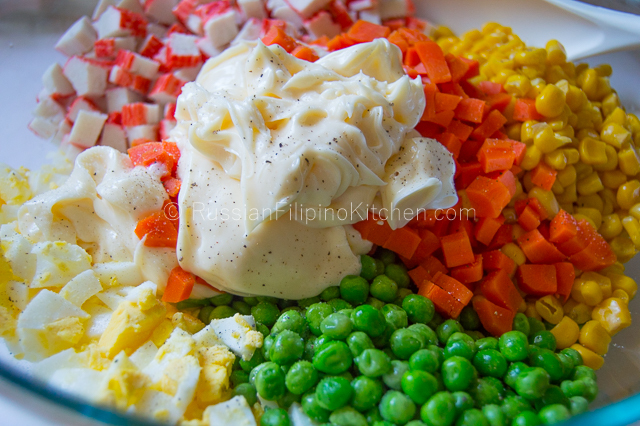 Place green peas, corn, crab meat, eggs, and carrots into a large mixing bowl. Add the mayo, salt, and pepper and mix gently. 8. Chill for at least an hour before serving for better flavor. In a medium sauce pan or cooking pan, place eggs and carrots together and add water just enough to cover. Bring to a boil and simmer over low medium for 15 minutes until carrots are soft enough to pierce. Note: I did this method many times and it works for me. Saves me the time, effort, dishes to wash afterwards, and of course the gas in cooking. However, you can use separate pots for boiling the egg and carrots, if you prefer. While the eggs and carrots are getting cooked, drain can of corn and place corn kernels on a strainer over a bowl to further strain excess liquid. Set aside until ready to use. Chop or dice crab meat into small cubes. As soon as eggs and carrots are cooked, remove from heat, place in a colander, and rinse in cold water until cool enough to touch. Peel eggs and carrots. Dice eggs into small pieces. Dice carrots into small pieces as well. Place green peas, corn, crab meat, eggs, and carrots into a large mixing bowl. Add the mayo, salt, and pepper and mix gently. Chill for at least an hour before serving (overnight better) for better flavor.